Date(s) Reported: 1837, Oct. 11 to 1904? In 1937, the city of London, England, was being terrorized by a most unusual series of assaults. People claimed to have seen and encountered some strange being or beings that would jump from nowhere, scare them, then run away. The assaults occurred in at least eighteen different West-end sections of London, and victims reported encountering a white bull, a white bear, a figure in brass armor with claw-like gloves, a figure in steel armor, and, in one case, a huge baboon seen to be dancing in the moonlight at Kensington Palace! These early reports were confusing, partly because the victims were so terrified that their stories were often hard to credit; the overall pattern, though, seemed to imply that a person or group of persons were dressing up in a number of fanciful costumes to startle people. Some people in London, however, began to feel that the assaults were of a more supernatural nature. This initial series of scares was largely ignored by the authorities, as they were reported by people of poor character or standing in London society, and because the assaults were more annoying than dangerous. But on January 8, 1838, the Lord Mayor of London announced that he was in the possession of a strong letter regarding these assaults; and he meant to stop the perpetrator, who was now being called “Spring-Heeled Jack” due to the leaps and bounds he escaped his victims with. A committee was formed for the purpose of capturing the strange character; apparently aware of this new threat, Jack’s next assault wasn’t in the West end of London; this time he struck in the East end. On a February 21, 1838, Jane Alsop, who lived with her father and two sisters on Bearhind Lane in the district of Bow, answered a violent knocking at the front gate to their house. A man in the shadows by the front gate identified himself as a police officer, and asked her to bring a light... he’d captured the infamous Spring-Heeled Jack! Excited, Alsop fetched a candle, hurried out to the gate, and handed the light to the policeman. He threw off his cloak and held the candle to his chest; in the flickering light, he presented a hideous appearance, his eyes resembling red balls of fire. She noted briefly that he wore a large helmet, and a tight-fitting suit that appeared to be a white oilskin... and then he vomited out blue and white flames. Lucy Scales met Spring-Heeled Jack less than a month later, on March 8. Lucy and her sister had just left the house of their brother, a butcher, to walk home; it was around half past eight at night. As they entered Green Dragon Alley in Limehouse, an empty street, a tall, thin, and gentlemanly figure in a large cloak and carrying a small lantern similar to what the policemen of the time used, stepped from the shadows and belched blue flames into Lucy’s face, blinding her. Lucy was so shocked that she immediately collapsed. As her sister came to her aid as Spring-Heeled Jack quietly walked away. These two later attacks were far more vicious than the earlier scares had been, and were the last that were attributed to the villainous character at the time. No more of these strange assaults occurred; perhaps because the attention of the police was becoming too close. Over the next sixty-six years, many other incidents occurred that some people believed were return visits of Spring-Heeled Jack. One well-known example of these later incidents are the reports that Jack sprang through an army garrison in Aldershot, England, several times in 1877; one of the soldiers on duty claimed to have shot the leaping figure dead center, but to no effect. Reports like this have led many modern researchers to conclude that Spring-Heeled Jack really was something very strange. In modern re-tellings, Jack's appearance is often described as “demonic” and “unearthly,” and his leaps are called “superhuman.” Many authors claim Jack was an alien visitor from another planet. Still others think the original Jack was a troublesome young aristocrat out for some mean fun, and all the other “Jacks” reported after him mere impersonators. Who or what was the original Spring-Heeled Jack that terrorized London in so many different forms in 1837? Was the fire-breathing attacker of 1838 related to the earlier reports? At this point in time, it’s very unlikely that we’ll ever know the real answers to these questions. "The Ghost, alias 'Spring-Heeled Jack,' Again," article in The Annual Register, or a View of the History of Politics of the Year 1838, 1839 London, England. pg. 26-27 of the 'Chronicle for 1839'. Online: Click here! "Outrage on a Young Lady," article in The Annual Register, or a View of the History of Politics of the Year 1838, 1839 London, England. pg. 23-24 of the 'Chronicle for 1839'. Online: Click here! 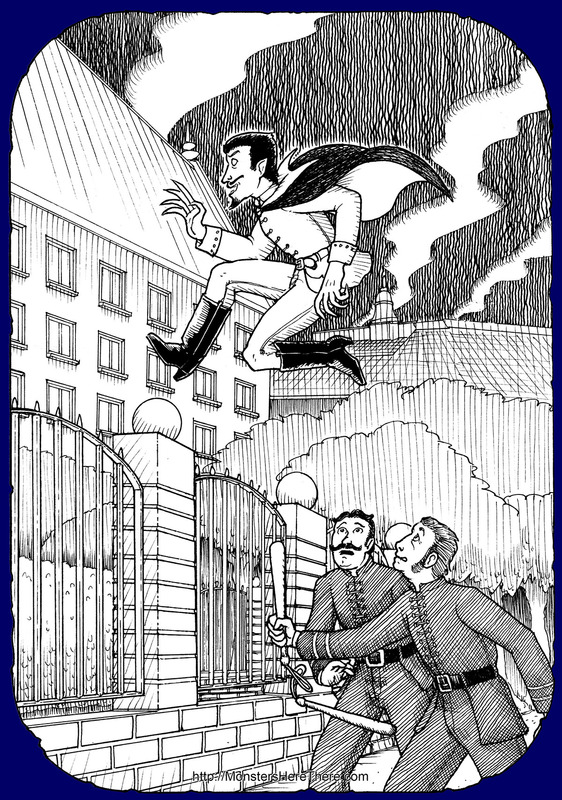 Spring-Heeled Jack: To Victorian Bugaboo from Suburban Ghost, by Mike Dash, 2010 website. Online: Click here!